In the spring of 2008, I took the Advanced Projects Lab class at the Electrical Engineering department at the University of Illinois. My project was to continue work on the analog modifications I had already started. I made quite a bit of progress! Here is my final report. To be able to play the GR-300 from a guitar equipped with a newer Roland GK-2(a)-type synth pickup, a GK2a-to-GR300 Interface is necessary. This interface requires cutting the Roland synth cables. Here is a description of the interconnection wiring run from the GR-300's boards to the external DB50 connector to allow easy interfacing and experimentation. It is desirable to have separate filters on each string and to be able to control external analog synth hardware with the GR-300. Unfortunately, the pitch control voltage scheme used inside the GR-300 is non-standard. The control voltages used are proportional to the PERIOD (cycle time) of the guitar string, rather than to its musical pitch value. Most analog synth circuitry uses a 1 Volt/Octave control voltage scheme. So in order to interface the two, a log converter circuit is necessary. Since the GR-300 does not have separate ADSR envelope generators on each string, there is no circuitry inside to derive gate signals from the envelope follower outputs. If you desire to add polyphonic envelope capability or to control external functions with a gate signal, an envelope-to-gate converter must be constructed. +----------+  |   +-------+              |        |    "Velocity"
I've implemented this scheme digitally, but so far never in analog. The multiplier would be trivial if you use a multiplier chip such as the Analog Devices AD633. I also have some Curtis CEM3391 synth chips which have the multiplier (as well as everything else you could want on a synth voice) built in. So far I have not tried hooking them up to the GR-300, but this should work great. The GR-300 only outputs one waveform shape, which is a chopped sawtooth wave. The non-chopped sawtooth wave can be run through this sawtooth-to-pulse converter circuit to obtain a pulse wave whose duty cycle does not change with the fret location, but which is adjustable and can be modulated by an LFO. Since the circuitry for a full-capability polyphonic synth is so huge, it is desirable to derive monophonic control voltage, gate, and envelope follower outputs from the GR-300's polyphonic circuitry. This requires a loudest-string-priority circuit and some analog multiplexers. 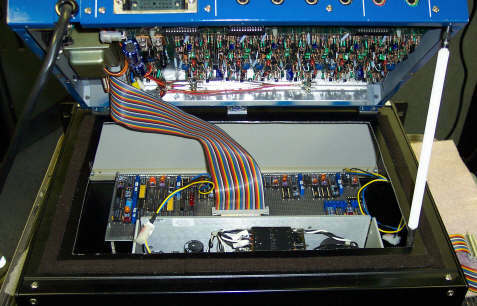 In constructing a synth based on the GR-300, many configurations are possible. If you don't feel like building or buying six fully functional monophonic analog synths to make a polyphonic guitar synth, a monophonic version can be designed. At some point I hope to use a monophonic version to drive the Modular Moog synthesizer at Pogo Studio. If you really are nuts, you might try to build a fully polyphonic version.